When we moved into our house here in York, the kitchen was the very first room that I updated. I have to say that this wasn’t a decision that made me very popular with Joe. The house had been renovated by a property developer and it had a spanking new, gleaming Howdens beauty installed, complete with granite worktop and light up glass wall cupboards. For many, this kitchen would have been the dream. Indeed, in the nine houses that we had lived in since Joe and I met, we had never before had a new kitchen - we (*read me) had spent many hours planning our dream kitchen without the cash to back up our plans. This cream coloured, pillared unit stunner was Joe’s dream. From his perspective, all that were missing were the white leather pump action comfort padded island bar stools. This is a man who would have inset spot lights in every room in the house if he were given the chance. Unfortunately, our personal kitchen dream goals were as far apart as a Brexit deal and as the person who spent the most time in the space, I decided that changes had to be made. And won. Obvs. The original kitchen. Yes, it’s a shocking and very tiny photo - I think I had an iPhone 1 or something similar. I was very clever, even if I say so myself. I removed the wall mounted display units, sold them on eBay and had solid wooden shelves made with the proceeds. I repainted the cupboards in Hague Blue, changed the handles, brought in the neon, a huge beaded chandelier and added a huge, vintage Persian rug (a move which caused some interesting views on my feed). You can read what I did in my blog post here, but I did it on a super tight (less than £1500 in total) budget and it looked vastly improved on the showroom styled, shiny yet characterless room that had come with the house. And I loved it. A lot. For two years. Then, reader, the inevitable happened. It started to bore me. Slightly better quality picture but it feels dated and needs a change. Okay, so there’s nothing ACTUALLY wrong with the kitchen but it was feeling, it has to be said, a little dated. Much as I loved Hague Blue when I decided on the paint colour, it was far too dark for the space. There’s two windows opposite each other in the room - one looking on to the courtyard and one on to the driveway, both of which provide very little direct light. I’d also made a classic last minute mistake when deciding on a wall colour. I’d been Brilliant White all the way to B&Q and when I got there, decided it was a little harsh and gone for Strong White instead. I’d taken the colour right up and over the ceiling (which is a heightening trick which I love) but because it's darker, it only served to make the room feel even gloomier. However, there were eight of Joe’s favourite inset spots in the ceiling as well as a five bulb chandelier, plus a couple of over the shelf wall lights so it wasn’t lacking light. In fact, when all were on it could easily have been mistaken for an operating theatre. Anyway, it wasn’t giving me any joy and I was totally over Hague Blue (and, in fact, dark colours in general) so changes were a coming. We’ve been in this house for four years now and when planning the revamp, I knew that I had absolutely no intention of removing kitchen base cupboards. They’re totally solid, good quality and the layout suits me perfectly. My main objective is to lighten the space and also to recycle and reuse what I already have wherever possible. I decided against telling Joe that I was going to update the kitchen until last week. I could see no benefit in including him in my plans and knew that he would immediately respond with, ‘didn’t you already update it two years ago?’ which would be swiftly followed by ‘why are you spending money on an unnecessary kitchen revamp when we could be paying for a family holiday?’. The project, therefore, was on a need to know basis. I was forced to tell him that changes were afoot when he returned home to find Miles The Worlds Best Decorator glossing the ceiling and someone from Freecycle at the door collecting the around the fridge larder unit. To be fair, he took it well. Strangely enough, he seems to be becoming accustomed to random house changes. So what are my plans and how am I going to banish the dark and, in the words of Anthony Burrill, bring back the golden sunshine? Here’s what I’m going to do. Birchwood kitchen from Custom Fronts. Around the fridge was a tall, ornate larder unit that always made my eyes bleed. Removing it has already made the space feel bigger and also forced me to reassess what was in my cupboards, culling the vast amount of chipped crockery and food tins which expired in 2011 (true story) to make my kitchen storage more organised. Winning already. I also removed a curved corner unit which wasn’t required to free up even more space. Both of these items I Freecycled to new homes. Aha, yes. Now, this is an EXCELLENT trick to make your kitchen look brand new at a fraction of the cost. I’ve recruited Kennet, the kitchen fitter, to measure up the doors and the lovely people at Custom Fronts will be making me new ones in Finnish Birch Ply. They’re light, bright and made from sustainable material with coved handles which means no hardware required. I wanted doors that were natural textured and unpainted and these ones are completely perfect for my requirements. I’ve been obsessed with ply doors since seeing a 1970’s kitchen in Livingetc about eight years ago so for me, these are a dream come true. I’m going to sell the old doors on eBay to contribute towards the revamp. So the current worktop is dark brown and I’ve never been that keen on it, tbh. It doesn’t help with the natural light issue and feels very dated. So I’m replacing it with white marble from Caesarstone which will transform the space and bring huge amounts of light back in to the room. I’m going to take the splash back up to the shelves and above the cooker which will be far more cohesive than the tiles that are currently in place. I’ve already arranged for the old one to be taken away and recycled. I’ve done what I should have done initially and had the entire room painted in Brilliant White. I’ve also, despite gasps of horror, had the ceiling painted in gloss white. Why? 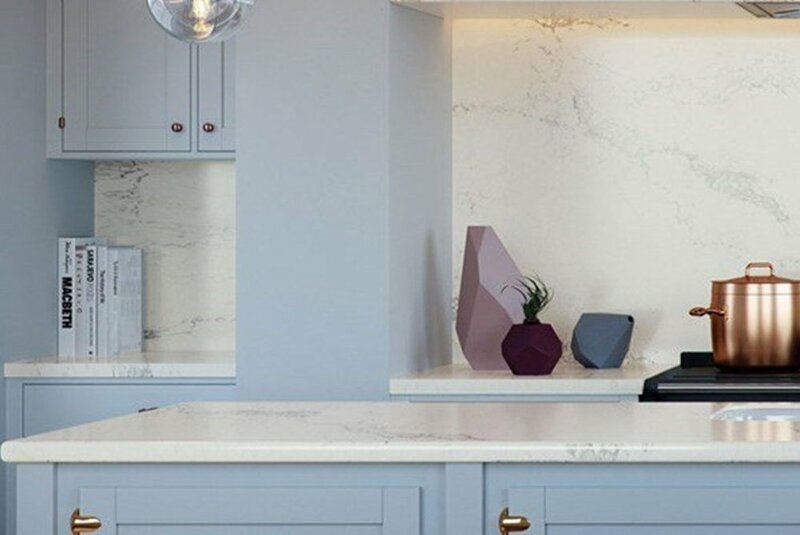 Because it reflects the light and with the new white marble work surface, it will give some serious light impact to the room. The blackboard wall is no more, although to be honest I ruined it when it was first painted by inadvertently drawing on it with non removable chalk pen (who even invented that and what even is the point?) so we’ve had dodgy looking hanging baskets on it for three years. So currently there are large cream tiles adorning the floor. Our house is old - 1759 - and the kitchen is in the original scullery area of the house. As such, it’s the coldest room. Even the radiator on full blast doesn’t stop it feeling like Siberia. It’s being screeded and then Amtico flooring will be laid on the top. I’m going for a medium tone laid in a pleat pattern and it’s going to feel much warmer to the feet. A simple change but one that will have a huge impact on the room. 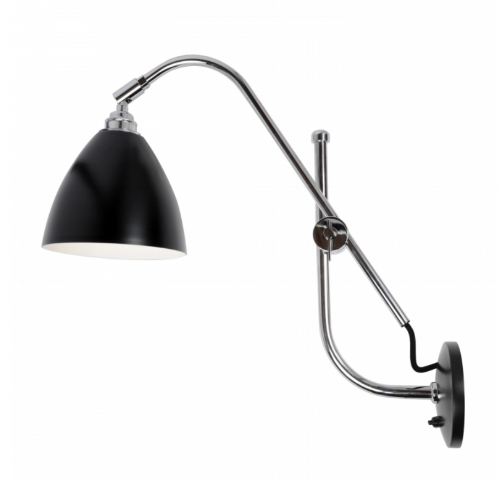 Task Wall Light from Original BTC. When I did my original update, I put fisherman’s lights above the shelves. However, I didn’t really think this through and quickly realised that because they weren’t extendable, the only area that they focused on was whatever was beneath them. Sort of pointless, really. I’m adding extendable task lighting from Original BTC which will allow light to reach the work surface and food preparation areas of the kitchen which will make a huge difference to the space. I’ve also found a vintage Danish lamp which will hang central in the room, over the dining table. Joe’s favourite spots will remain, unfortunately, but I’ll put them on a dimmer to create a more subtle look. I’m going to add a new sink from Grohe - it’s a full basin rather than the split one which is there at present which is much more suitable for my needs. I’m also getting a hot tap so that I can be kettle free, keeping the new work surface nice and clear. This is Joe’s absolute dream - he has always wanted one - so he's pretty pleased about this addition. It may even encourage him to make a cup of tea. Miracles can happen. We’ve got a workbench in our garage that came with the house and upon closer inspection (and removing the four years worth of rubbish that was covering it), we discovered that it’s an old wooden dining table. I’ve ordered a orbital sander (I’m so tech) and I’m going to sand it down to see what it looks like. It’s unbelievably heavy but I I think if it works, it will be great. I’ve already got kitchen chairs but I may have to reassess in favour of stools if the table turns out to be too high. I’m hoping it will work though - I think it would look great. I’m happy with all the appliances and there’s no need to change any. The only thing I’ve updated is I’ve swapped the single wine fridge for a double to fill the space left by the larder unit. Priorities. That’s pretty much my plans. I spend more time in the kitchen than I do in any other room in the house and I think it’s going to make a huge difference. I’m obsessed with bringing in the natural materials and textures and love the mix of the different types of wood. I think that the white surfaces and walls will make a huge difference to the lightness of the room and think the whole effect will be really calming. So let the changes commence! The plan is for it to be finished before Christmas so fingers crossed it all sticks to schedule. Let’s see if Joe notices the difference. Part of my kitchen refit will be carried out in collaboration with sponsors. I would never work with a brand or use their products in my home if I didn’t really love them and feel confident promoting them.